This is a small 6x9 generic manual that is estimated to be circa 1930's - 1940's. It covers all sizes, but has limited generic information and the parts section is made up of photos of parts laid out on a table. Newer manuals were developed to cover slightly newer design machines and those manual are much more informative, but may not include some information on the slightly older machines. When in doubt, it is our recommendation that customers needing a Cincinnati Hypro VTL Manual purchase both the old and newer versions of the manual, as the old manual should cover the old version details while the newer manual provides much more information. Having both manuals on-hand provides maximum information when working back and forth between the manuals. 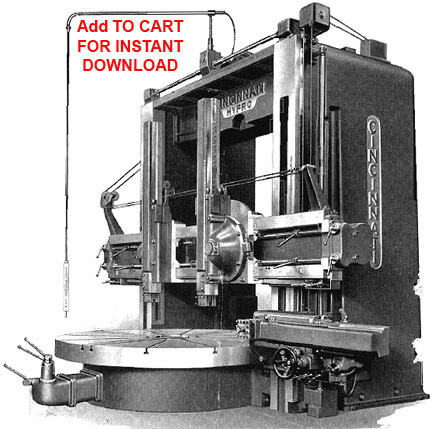 This newer manual was developed to cover the slightly newer design machines (early 50's) and these manual are much more informative, but may not include some information on the slightly older machines. When in doubt, it is our recommendation that customers needing a Cincinnati Hypro VTL Manual purchase both the old ($98) and newer versions of the manual ($195), as the old manual should cover the old version details while the newer manual provides much more information. Having both manuals on-hand provides maximum information when working back and forth between the manuals.